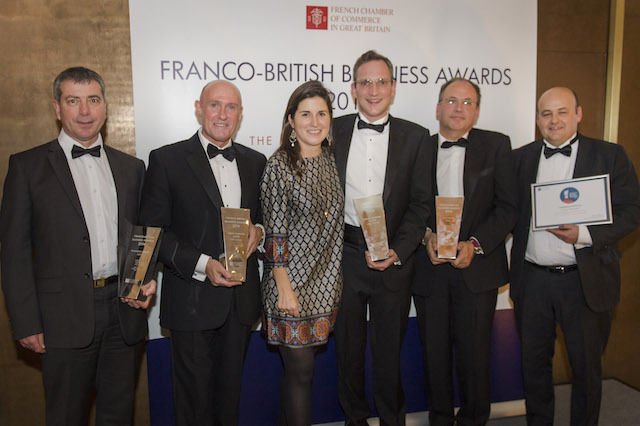 The event has become an important date in the calendar: on 27 November, for the fifteenth year running, the French Chamber of Commerce in Great Britain organised the Franco-British Business Awards. Five companies were singled out by the jury: Merci Maman, ARM, Saint Gobain, HSBC and Caviar Petrossian. 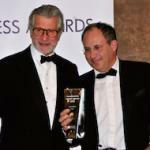 Black tie, champagne, red carpet… The Franco-British Business Awards 2014 looked like the Césars! Approximately one hundred and seventy people were gathered for the ceremony in one of the May Fair Hotel's splendid private rooms. Arnaud Bamberger, President of the French Chamber of Commerce in Great Britain, opened the ceremony – not without humour – with a few words, followed by a speech by Sylvie Bermann, the French ambassador. Both of them paid tribute to the companies that had been nominated for their “dynamism and creativity”; “I know it has been hard for the jury to decide between the candidates”, the Ambassador declared. Arnaud Bamberger recognised the “quality and diversity” of the 2014 applicants, a sign of “the on going success of these awards”. For this fifteenth edition, nine companies were short listed. In the SME/Entrepreneur category, the ten-member jury rewarded Merci Maman. Launched in 2007, this PME is a real success story. Béatrice de Montille started creating and selling personalised jewels from her kitchen table in her house in London. Today, the business has eight employees and sends its creations all around France and the UK. Merci Maman products have largely been adopted by the Brits, particularly for their “French touch” (the jewels are engraved with a French cursive handwriting). Even Kate Middleton has her own necklace! A German version of the website should soon be released; why should such a success be only confined to France and the UK? The Innovation award was received by ARM. This British company provides digital tools to leading electronics companies to allow them easy access to their market; it designs processors and related technologies for developers, designers and engineers that break down the barriers to innovation. ARM’s technology enables the creation of new markets and the transformation of industries and companies. ARM was launched in 1990 when their sector was a very different place. Saint-Gobain, world leader in construction materials, were the winners of the Large Corporate Award, just ahead of Airbus. HSBC bank received the Jury award, for its collaboration with the Chamber of Commerce. The “Coup de Coeur” Award, went to the French company Caviar Petrossian, recently established in the UK. The five companies were praised for their successful launches to both the French and the British markets. The laureates were rewarded because of their innovation and determination and spirit. Béatrice de Montille, founder of Merci Maman, said that she was “very touched and very proud” to receive the SME/Entrepreneur award, which should help Merci Maman “change gear today”. The competition has been, ever since its creation in 2000, a testimony to the dynamism of firms in France and in the UK, but has also embodied the strength of the economic relationship between the two companies. And this strength, Sylvie Bermann explained, “rests on these businesses that succeed by relying upon both markets.” They boost the two economies by combining the best from each nation’s qualities. In 2013, France was the third largest investor and the second biggest source of jobs created in the UK. May this continue for many years to come! For more photos of the Franco-British Business Awards, click here.